Climate change is expected to have a variety of effects on global temperatures, sea levels and the availability of water in agricultural landscapes. According to the Intergovernmental Panel on Climate Change (IPCC), since 1950 average global surface temperatures have risen by ~0.7°C and the sea level has risen by ~10 cm. 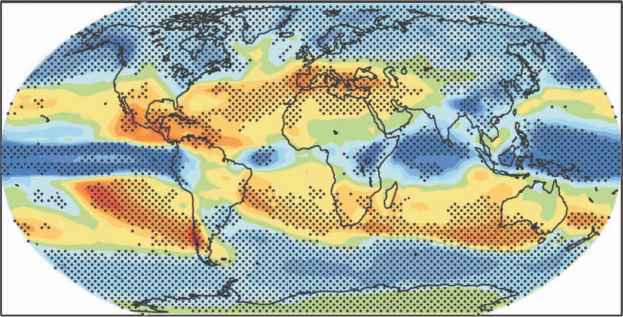 There has also been decreased precipitation in the Sahel, the Mediterranean, southern Africa and parts of southern Asia, and an increased risk of heavy precipitation events over most areas (IPCC, 2007). Over the next century, average global surface temperatures are expected to rise by 1.8-3.5°C. As a consequence, the thermal expansion of the oceans will lift sea levels by up to 0.6 m, annual precipitation will increase in high latitudes and decrease in most subtropical land regions, and future tropical storms will become more intense (IPCC, 2007). One of the large unknowns is the extent to which the melting of the Greenland and Antarctic ice sheets will impact on sea-level rise. The 2007 IPCC report notes that the expected future temperatures in Greenland are comparable to those inferred for the last interglacial period 125,000 years ago, when palaeological data suggest that the loss of polar land ice was associated with a 4-6 m rise in sea level (IPCC, 2007). Global climate change is likely to invoke substantial changes to the world's agricultural regions and the severity with which abiotic stress will affect crop production. 1We prefer these separate terms to 'flooding', which is used ambiguously in the literature to refer to both saturation of the soil (waterlogging), which affects roots (e.g. Barrett-Lennard, 2003; Colmer and Flowers, 2008), and the covering of shoots with water (inundation), which affects both shoots and roots (e.g. Pedersen et al., 2006). (Barrett-Lennard, 2003). In these cases the combination of salinity, waterlogging and inundation may be of natural origin, linked with proximity to waterways, lakes and flood plains (primary salinity), or it may have an anthropomorphic origin (secondary salinity). In the latter cases, the agricultural vegetation uses less than the incident rainfall (or irrigation water), excess water percolates into the soil profile, the water table rises towards the soil surface, and where the groundwater comes to within ~2 m, salt rises to the soil surface through capillarity (Ghassemi et al., 1995). The total area of secondary salinity around the world has been estimated at ~76.6 million ha (Table 6.1), though this is almost certainly an underestimate, being based on data accessible in 1991.
and the physiology of halophytic vegetation (reviewed by Colmer and Flowers, 2008). Climate change can be expected to have varying effects (both negative and positive) on the expression of salinity, waterlogging and inundation in landscapes. First, there will be increased irrigation with hazardous water. Hydrological basins are defined as being water stressed if they either have a per capita water availability of less than 1000 m3/year or they have a ratio of withdrawals to long-term average annual runoff above 0.4. Using these criteria, water-stressed basins occur in northern Africa, the Mediterranean region, the Middle East, the Near East, southern Asia, northern China, Australia, the USA, Mexico, north-east Brazil and the south-west of South America. These areas have a population of 1.4-2.1 billion people (Bates et al., 2008). As areas at risk become hotter and drier, good quality water will increasingly be reserved for drinking and urban use, and irrigators will turn to the use of brackish water and water of high sodium hazard. Irrigation with water of high sodium hazard on fine textured soils leads to soil sodicity (i.e. the decline of soil structure associated with the substitution of Na+ for Ca2+ in the soil's cation exchange complex). Under these conditions, there is a decreased rate of infiltration, a lack of salt leaching and the development of saline/waterlogging stresses (reviewed by Qureshi and Barrett-Lennard, 1998). with permission from University of New South Wales; data from Oldeman et al., 1991). tropical storms. The IPCC rates the probability of a link between increased tropical storm activity and global warming as 'more likely than not'. In the North Atlantic the 10-year running average number of named tropical storms has increased from ~10/year (19301990) to ~15/year (1998-2007) (Pew Centre on Global Climate Change, 2009). The effects of climate change are likely to be especially severe for regions in South Asia. The frequency and severity of inundation are expected to increase due to increased rainfall and temperatures. Monsoon rainfall is expected to increase in magnitude and raise the frequency and severity of inundation in the Ganges, Brahmaputra and Meghna basins (Douglas, 2009). Furthermore, higher temperatures will increase the melting of Himalayan snowfields and glacial ice, significantly increasing the occurrence of inundation through greater river flows and extreme weather events (Jagtap and Nagle, 2007; Douglas, 2009). Inundation in landscapes at risk of salinity will cause substantial increases in recharge to the groundwater, a rise in the water table and increased expression of salinity as the groundwater evaporates at the soil surface. The most acute consequences of inundation can presently be seen in Bangladesh, where nearly 85% of the rainfall occurs during the monsoon (June-October). High-intensity floods occur when any two of the three major rivers reach peak flow conditions simultaneously, and over half of the country has an elevation within 10 m of average sea level (Ahmad and Ahmed, 2003). In this landscape, the return period of severe floods is every 7 years (Ahmad and Ahmed, 2003), and during the 1998 flood, about 70% of the country's area was inundated (compared to an average value of 20-25%; Bates et al, 2008). Soil salinity in the field is commonly measured as the electrical conductivity of the saturation extract (ECe). The coastal ricelands of Bangladesh generally have a shallow water table (~1.0-1.5 m below the soil surface) and in the dry season soil salinity in the upper 15 cm of the soil profile varies from between moderately (ECe = 4-8 dS/m) to highly saline (ECe = 8-16 dS/m) (Mondal et al., 2001). Thirdly, there will be adverse effects on agricultural production and natural ecosystems in landscapes at low elevations above sea level. Coastal areas exposed to the future rising sea level will be subject to an increased risk of inundation from high tides and storm surges, and from increased subsoil seawater intrusion. Such areas include the world's river deltas, especially the Asian mega deltas of the Ganges-Brahmaputra in Bangladesh and West Bengal (Bates et al., 2008). Nicholls (1995) predicts that an increase of 1 m will inundate over 17% of Bangladesh. Clearly, sea level rise will have major implications for the severity of salinity, waterlogging and inundation, future land use and the development of more tolerant crops for the region. However, not all the effects of climate change on salinity, waterlogging and inundation will be negative. In semi-arid environments there may be decreases in dryland salinity associated with a decline in depth to water table. In the south-west of Australia, dryland salinity is caused by the replacement of native vegetation with annual crops and pastures; this has resulted in a general rise in water table over the last 150 years, and about 2.32 million ha have been regarded as being at risk from dryland salinity (Sparks et al., 2006). However, since 2000 the region has experienced a decline in winter rainfall of about 20% (Bureau of Meteorology, 2009), which has caused an increase in depth to water table, decreasing the area at risk of salinity, particularly in the northern (drier) areas of the wheatbelt (George et al., 2008). This chapter has three main sections. First, we examine the effects that salinity, waterlogging, inundation and their interactions have on crop plants and the traits that plants need to withstand these effects. Secondly, we consider three different approaches for the selection of plants for affected landscapes: (i) selection within crop species; (ii) the development of hybrids between adapted wild species and crop plants; and (iii) the domestication of halo-phytes. Finally, we conclude with some thoughts about priorities for future research.